Have you been disappointed by Fallout 76? Well, it looks like you may have another irradiated open-world option soon, as it seems the Far Cry series is going full post-apocalyptic. You can check out the new teaser trailer for the next Far Cry, below. Interesting stuff! 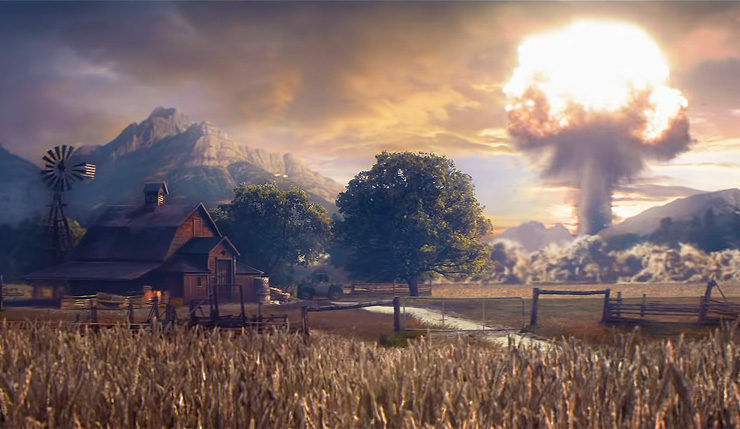 The bucolic country setting seen at the beginning of the trailer strongly suggests the next Far Cry will take place on an atom-bomb-altered version of Far Cry 5’s Montana map. That said, it may not be your typical dusty post-apocalyptic setting, as it’s hinted the new Far Cry will take place some time after the bombs drop, in a world where nature is once again flourishing. As for gameplay, the final moments of the teaser indicate some sort of unique weapon crafting system will be included. It will be interesting to see what form this next Far Cry takes, as it’s only been nine months since the release of Far Cry 5. Will it a standalone expansion like Far Cry 3: Blood Dragon? My money’s on something similar to Far Cry Primal – a full-scale game, featuring a new setting, that largely reuses the basic map/geography of a previous game. I suppose we won’t have to wait too long to find out! The Game Awards 2018 happen this Thursday (December 6). A number of other announcements, including ones for Dragon Age, a new Obsidian RPG, and a Crash Team Racing remaster have already been confirmed or rumored. Seems like it’s going to be a busy night!